Most of us have watched a viral video online. But what happens if that video involves someone from your family? And you first hear about it on the news? 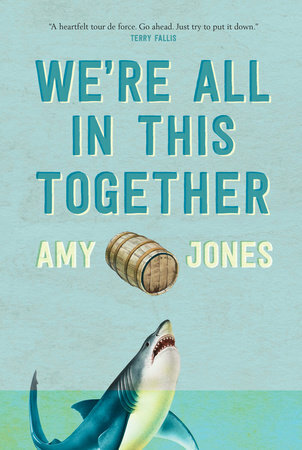 That’s what happens to Finn Parker in Amy Jones’ debut novel We’re All In This Together. Finn sees a video of a woman go over Kakabeka Falls in a barrel and survive. That woman just happens to be her mother, Kate. Finn finds herself pulled back to a life, a town, and the family which she had abandoned. Her twin sister, Nicki, doesn’t want her back in Thunder Bay. Their dad, Walter, is mostly absent, out on Lake Superior rather than facing his family. Their adopted brother, Shawn, is trying to hold the Parkers together while his wife, Katriina, is slowly falling apart on the sidelines. And Nicki’s teenage daughter, London, is more concerned with meeting the marine biologist she has a crush on than having anything to do with her stupid family. We’re All In This Together is written from multiple viewpoints, which lets you see the same events through often drastically different perspectives. This was most evident between Finn and Nicki, who are identical in looks but totally different on the inside. These viewpoints reinforce how real the Parker family is. Sure they are dysfunctional in their way, but what family isn’t? The story, while sometimes a bit crazy, will keep you reading. We’re All In This Together gives hope for how even a splintered family can come back together in a time of great need. We’re All In This Together is The Thunder Bay Public Library’s first One Book: One Community book. For more information and to get involved in our fall events for this book, please visit tbpl.ca/onebook. Shauna Kosoris is a member of the Thunder Bay Public Library staff.